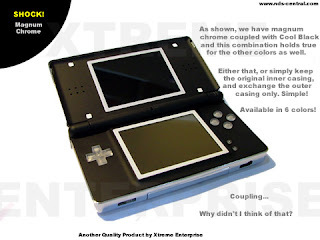 Check out nds-central.com, you'll find tons of different Nintendo DS versions and how-to videos about replacing your DS and Wii shells. Very cool! Glad your Swench is back up. I was getting withdrawals pain. Do you have a team of people finding all this information? How do you have time to post so many posts? I enjoy your site. Sorry for the hassle, Blogger is really slow with customer support (I'm still having trouble hosting the blog on www.swench.com). I'm actually by myself. It's pretty easy to post that much. Some of the news are posted on our message boards at work, but the rest is just from the sites I visit every day. I like to be up to date with nerdy stuff.